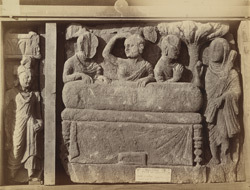 Photograph of a sculpture piece of the worship of the Buddha's coffin from Nullah, Sanghao in Peshawar district taken in 1883 and attributed to Henry Hardy Cole (probably incorrectly). The sculpture is boxed for transportation and bears a label, stating that it was received from Major Cole in December 1883, and is now in Lahore Museum. From the first and second centuries AD onwards, Peshawar, in northern Pakistan, was famous for it's sculptural traditions. Known as Gandhara, it was ruled by a dynasty of Chinese origin called the Kushans. They were Buddhists and under their rule, the religion and the arts associated with it were allowed to flourish. The reign of the Kushan king Kanishka, is particularly well known for its artistic achievements and it was during his reign, from 78 AD, that we find the first examples of the Graeco-Roman influenced Gandharan style of sculpture. The classical influence on this sculpture slab can be seen, in the figures draped clothing, their curly hair and the naturalistic modelling of their bodies.